Courtesy of BETTER HOMES AND GARDENS REAL ESTATE CHAMPIONS, BRIAN BEAN. This wonderful cul-de-sac home is the perfect mix of upgraded comfort and outdoor enjoyment. Built by Meritage, this home is a candidate for multi-generational households, featuring 5 bedrooms and 4 full bathrooms, including a jack-and-jill arrangement. The home has bonus rooms for such uses as an office, den, workout room, or even a makeshift extra bedroom (just add wardrobe!). Step into the foyer with sprawling tile hallway. It leads to the bonus rooms, full bath, laundry/utility room, formal dining room, and finally, the massive greatroom and granite kitchen. The laminate floors make cleaning and maintenance a breeze. You may need more furniture to fill the family room, which also features a gas fireplace and an entertainment niche large enough for the biggest of flat-screens. Check out the gorgeous kitchen with massive island. The stainless steel cooktop and oven are built in and set up perfectly for multiple hands in the kitchen. Don’t forget the billpay/homework station. Upstairs, you’ll find spacious bedrooms and the same high ceilings as downstairs. Two guest rooms share the Hollywood bath and two others share a separate full bath. The master suite features dual vanities, separate bath/shower, and dual walk-in closets with built-ins. Outside, enjoy two stamped-concrete areas, one in a private alcove and another with a firepit and retaining wall. Woodbine Park is nearby, as are Diamond Valley Lake, shopping, services and easy I-215 access. 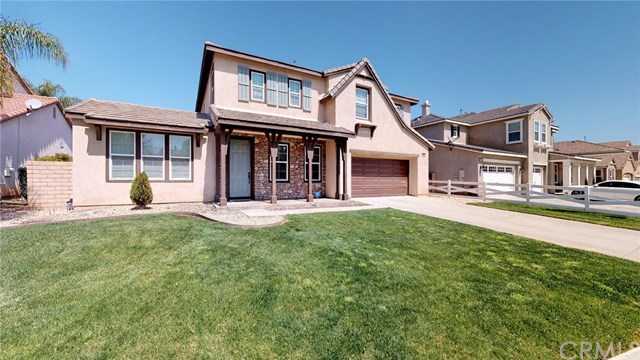 Please, send me more information on this property: MLS# IV19063056 – $459,900 – 29162 Roselite Circle, Menifee, CA 92584. I would like to schedule a private showing for this property: MLS# IV19063056 – $459,900 – 29162 Roselite Circle, Menifee, CA 92584.